1. Add the shredded coconut, sunflower seeds and dates to a food processor. Blend until finely chopped. 2. Pour in the coconut oil and dark chocolate chips and blend until the oil is incorporated into the mixture. 3. Stir in the dried cranberries. 4. Form into about 1 ½ inch balls. Refrigerate until hardened (about 5 – 10 minutes). You can eat them right away, but just keep in mind that they won’t harden until they are in the fridge for a few minutes. 1. Whisk the fruit juice and the gelatin together in a medium sized pot. Let sit for 5 minutes. 2. Turn on the stove to medium and place the pot on the burner. Stir until heated through and the gelatin is all the way dissolved. Do not bring to a boil. 3. 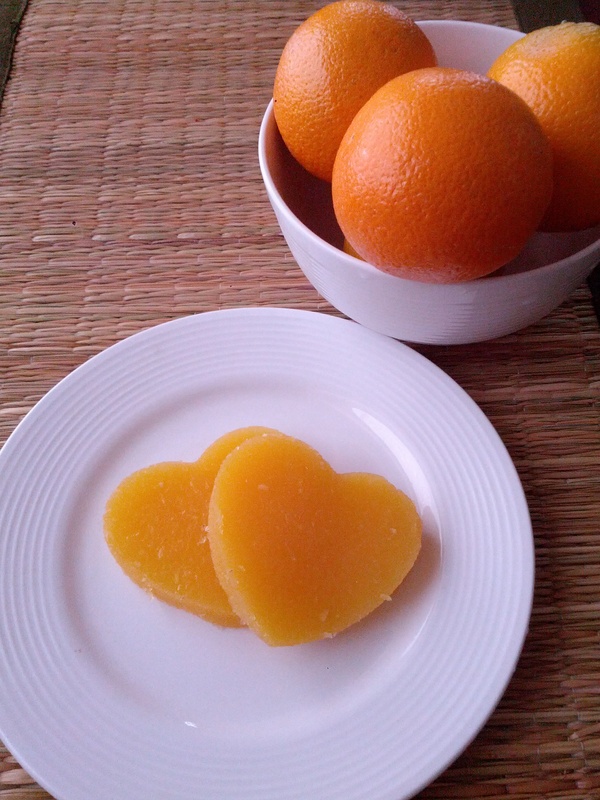 Once the gelatin is completely dissolved, turn off the heat and add the honey. Stir until well mixed. 4. Pour into an 8×8 pan. Cover and refrigerate until set. 5. Cut into squares and enjoy! Store leftovers in the fridge. 1. Peel the sweet potato and cut into thin round slices using either a mandoline slicer or the slicing blade on a food processor. 2. In a large skillet, add the coconut oil and heat over medium-high until the oil is hot enough to sizzle when you put in a slice of sweet potato. 3. Fry the sweet potato chips just a few at a time, making sure not to crowd the pan. 4. 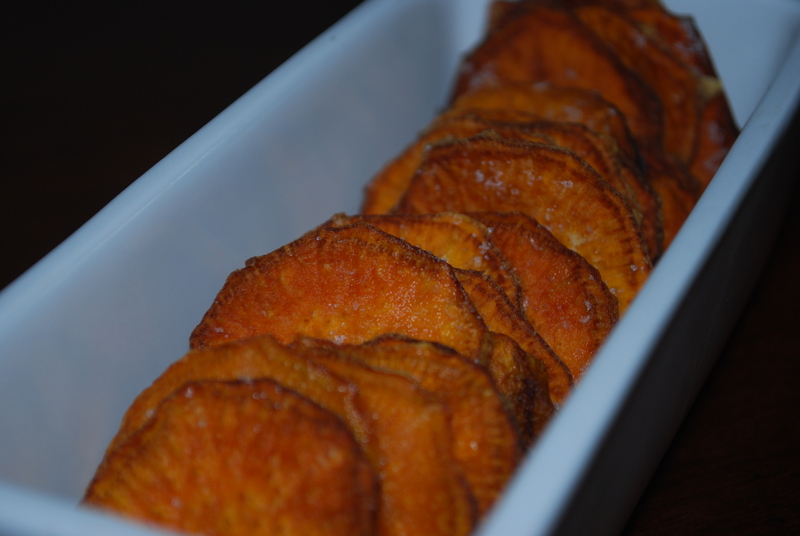 Once the edges of the sweet potato slices start to curl and turn golden brown, flip them with metal tongs and cook for another minute or two, but watch them carefully so they don’t burn. 5. When the chips are done, remove them from the pan and put them on a plate with paper towels to drain. Sprinkle with sea salt, and enjoy! 2. 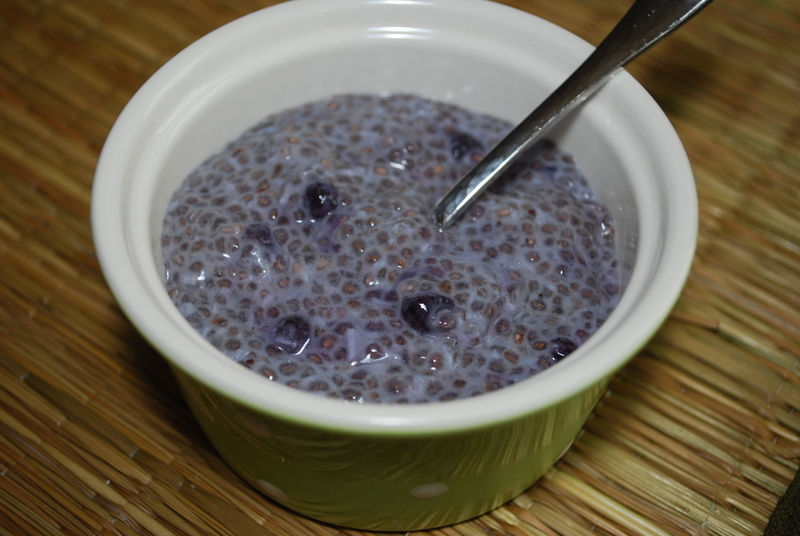 Refrigerate 60 minutes or until thickens (you can leave it overnight and eat it for breakfast!) You can stir halfway through just so all the seeds get mixed in. Have fun experimenting with the amount of seeds also. 2. Wash and dry kale and cut into bite-size pieces (make sure to remove tough stems). 3. Brush olive oil into kale with a pastry brush, thoroughly coating. 4. Add sea salt and mix. 5. Spread out on baking sheet, making sure that kale is not overlapping. 6. Bake for 15 minutes or until crispy. Enjoy! 2. In a large mixing bowl, add the nuts and finely chopped dates. 3. In a separate bowl, drop in the egg whites, add the cinnamon, and beat with a fork until the cinnamon is blended with the egg whites. 4. 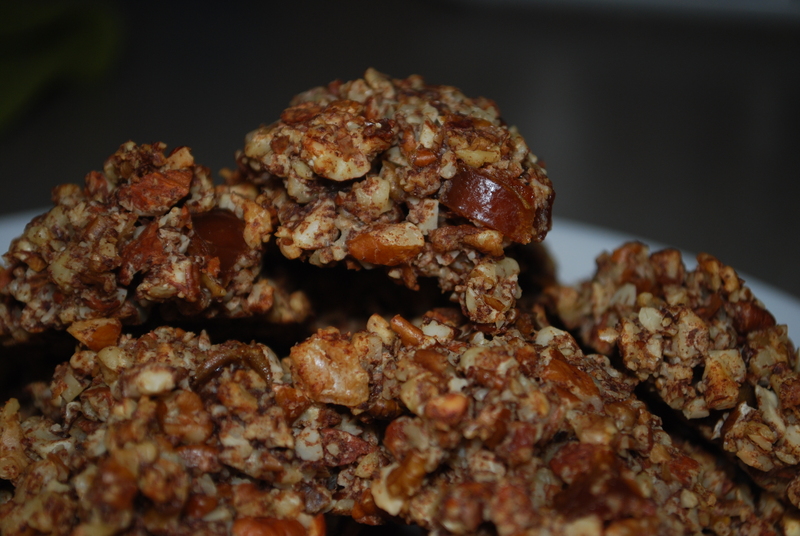 Pour the egg whites over the nuts and dates and mix until everything starts to stick together. 5. 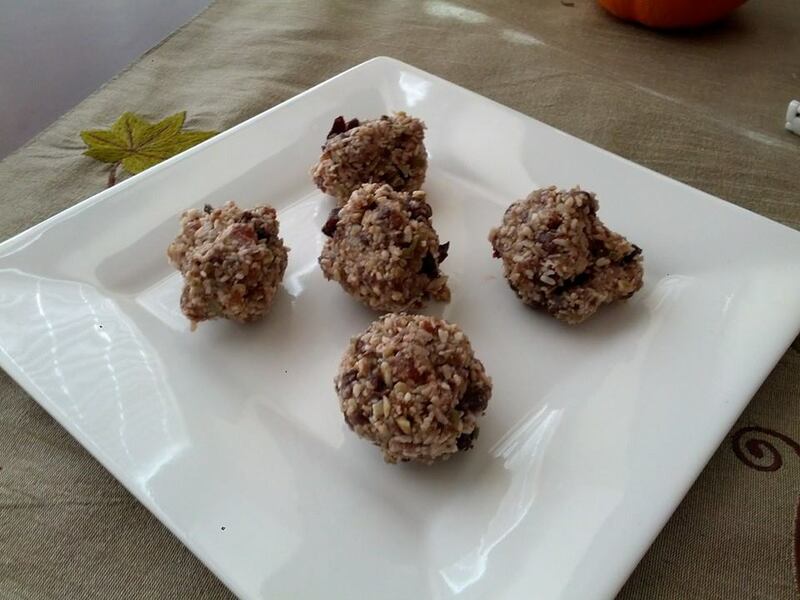 Using your hands, create balls of the nut, date, and egg white mixture (about the size of golf balls), and place onto a baking sheet greased with coconut oil or ghee. 6. Still using your hands, compact each cookie so that they hold together in the oven. 7. Bake for 15 minutes. Makes 14 cookies. 1. Peel and slice the banana lengthwise. 2. Spread a thin layer of almond butter and make it like a sandwich. 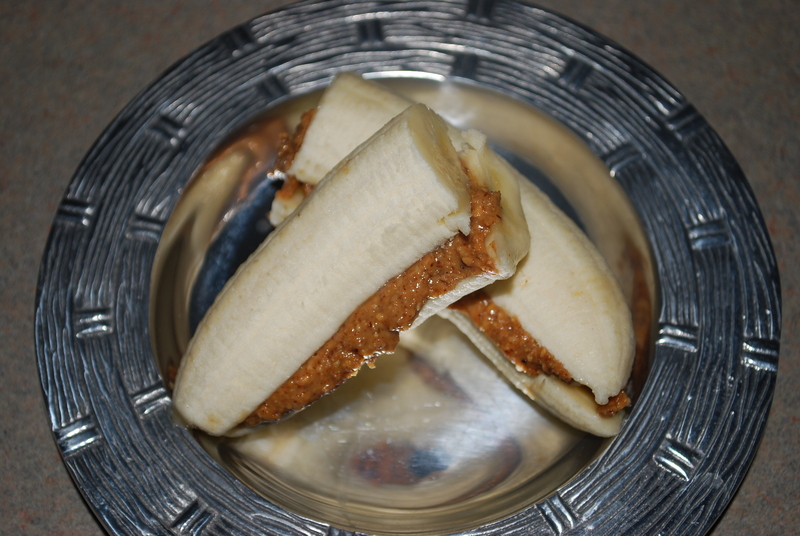 *You can also dice the banana into little circles and drop a dollop of almond butter on each. 1. 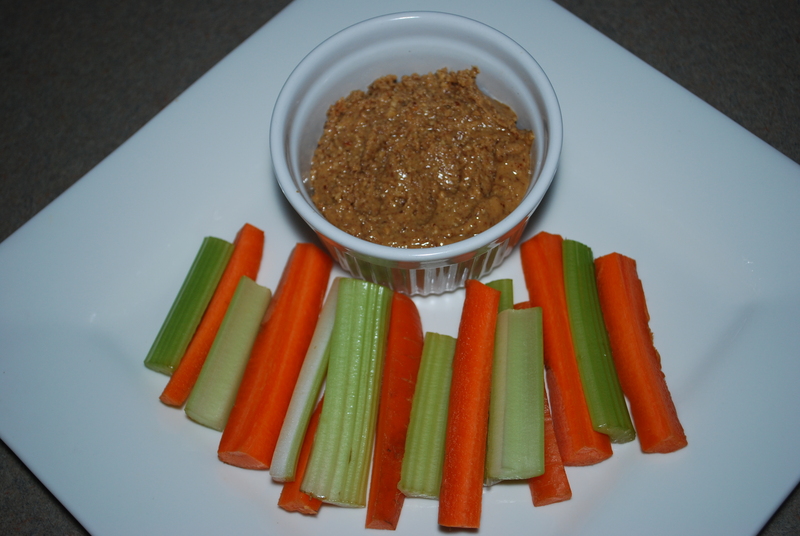 Slice carrots and celery into desired size and dip into said almond butter. I bring these along on trips as a quick and filling snack if I’m in a pinch. Emma will even ask for them by name! 1. Bring frying pan to medium-high heat. 2. Toast pecans for 3-4 minutes and then add butter to the pan. 3. 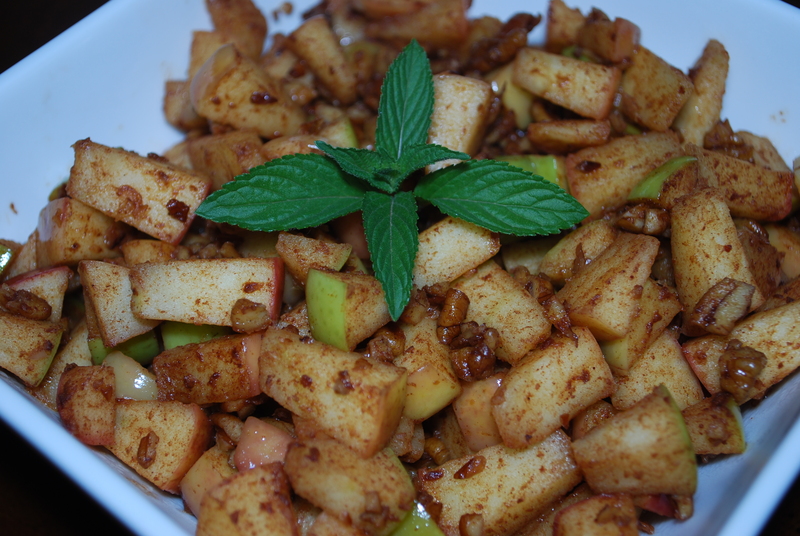 Add the apples and cinnamon. 4. Sauté for 5-7 minutes and serve. Variations–Peel the apples before cooking. Once they soften, mash them up for homemade apple sauce. 2. Use an apple corer or long knife (and steady hand) and core your apple(s). 3. With a long knife or mandoline slicer, slice your apples to about 1/8″ thick. 4. 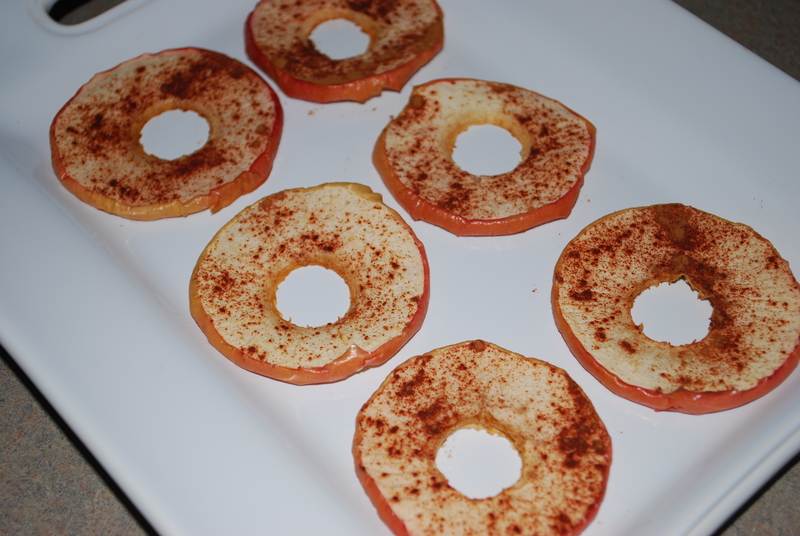 Arrange them in a single layer on a baking sheet with a non-stick baking mat, and sprinkle with cinnamon. 5. Bake for 2 hours (to make them crisp), but check them at 1 hour (they will be soft/chewy). 1. Mix the cumin, chili powder, cinnamon, and cayenne, in a small bowl and set aside. 2. Preheat a large cast-iron skillet or other large skillet over medium heat. 3. Add nuts and toast until lightly browned, being careful not to burn. 4. Add butter and vanilla to coat nuts, then sprinkle spice mixture over nuts and stir until well combined. Mix in some raisins and/or cherries, if you choose. 5. 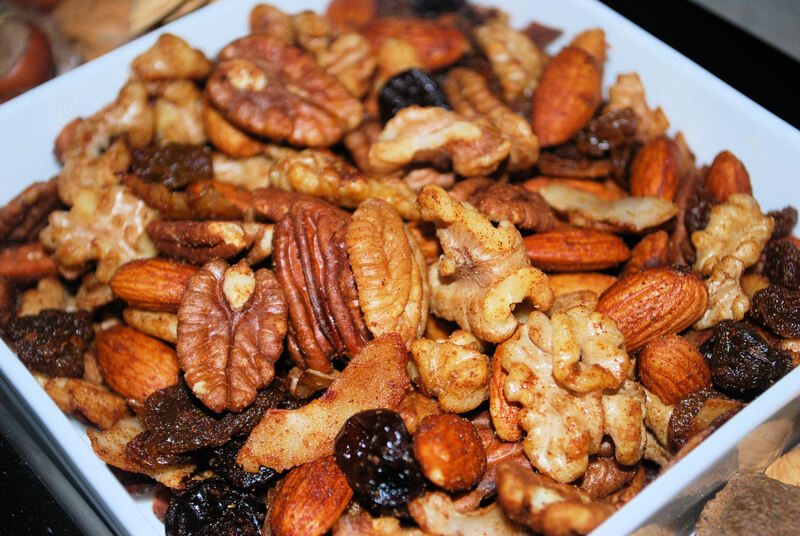 Spread nuts out on a large cookie sheet to dry, or serve warm right out of the pan. 1. Leave the peel on the plantain and cut off the ends. Cut thin round slices. Leaving the peel on while slicing will help prevent smashing the plantain. 2. After the plantain is sliced, carefully remove the peel and place sliced plantains into a skillet of hot coconut oil. Fry for about 2 minutes on each side, using tongs to flip, and being careful no to burn. Place on paper towels to cool. *You can also sprinkle with cinnamon if you don’t make the guacamole. 3. 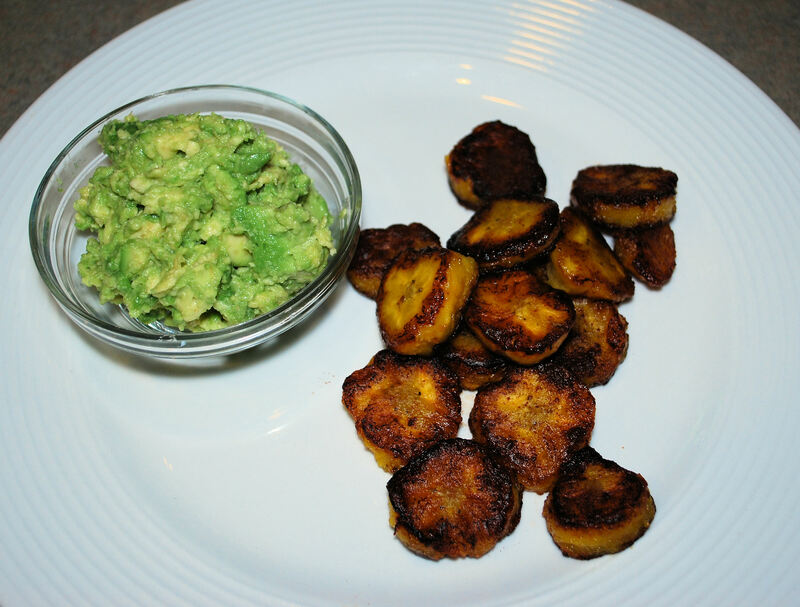 Mash the avocados with the lime juice, garlic powder, and black pepper, and serve with the plantain chips.